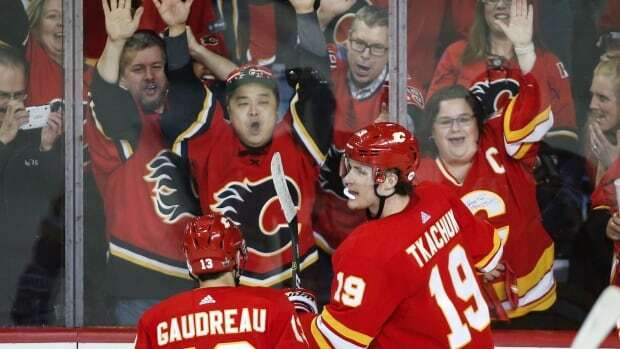 Rookie left-winger Andrew Mangiapane scored the eventual winner and Mike Smith made 26 stops as the Calgary Flames shut out the Colorado Avalanche 4-0 on Thursday to win Game 1 of their first-round series. It took until 14:25 of the second period for the game’s first goal, but it was worth the wait as Mangiapane’s unassisted goal was a highlight-reel effort. The sequence began with Garnet Hathaway’s heavy hit on Erik Johnson on the side boards. Mangiapane collected the loose puck and took it to the net where, showing tremendous patience, he wove around Nikita Zadorov and carried the puck across the top of the crease before sending a backhander from his knees past sprawling goalie Philipp Grubauer. “The puck was sitting there for me. I had space and took it to the net. It was a nice play by [Derek Ryan] in front, tying him up and screening the goalie. I just wanted to bring it to my backhand and I saw open ice there. I’m happy it went in,” Mangiapane said. A big moment in the game came early in the second as the Avs went to the power play for the third consecutive time. With all the momentum with the visitors, Smith made two key glove stops 30 seconds apart to keep the game scoreless. Then, with a little extra flourish afterwards, Smith threw out his glove to snag Derrick Brassard’s dangerous snap shot. “Our killers did an unbelievable job to kill off all those penalties and I was able to make a couple big saves there in the second, then we go down the ice and [Mangiapane] scores a big goal for us, so obviously that’s a big momentum swing in the game,” Smith said. From that point through the end of the game, chants of “Smitty, Smitty, Smitty” broke out regularly from the raucous, sold-out, red jersey-clad crowd. “I haven’t quite heard anything like that before in my career, it gives you some confidence when you hear your name getting chanted,” Smith said. It was Smith’s first playoff shutout since May 20, 2012 with the Phoenix Coyotes when he made 36 stops to shut out the Los Angeles Kings in Game 4 of the Western Conference final. The Coyotes lost the next game and Smith hasn’t played a playoff game since. Grubauer made 28 stops for Colorado.